You Totally Got This says: If you can’t take a vacay, eat like you’re on one! 2 round bread rolls (regular or gluten free). Slice the chicken breast horizontally into 2 even pieces and mince the garlic. Season both sides of the chicken breast with salt and pepper, then sprinkle the garlic evenly over the top of each piece. Add the olive oil to a large frying pan and heat over medium to high heat. Add the chicken breast pieces and cook for 4 -6 minutes on each side, until the meat is no longer pink and the juices run clear. While the chicken is cooking add the bacon and cook for 3 -4 minutes each side until the bacon crisps up and turns deep brown. Meanwhile slice the rolls and put them under the oven grill (keeping an eye on them so they don’t burn). Next cut the cos lettuce leaves into thirds, slice the tomato and avocado and set aside. Once that is done place the coleslaw in a bowl and mix in 1 tbs mayonnaise. Season the coleslaw with salt and pepper. Finally, mix the remaining tsp of mayonnaise and Dijon together in a small bowl. Once the chicken and bacon are cooked, it’s time to assemble the burgers. 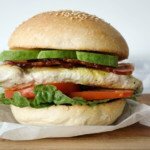 Start by spreading the mayonnaise and Dijon mixture on the bottom of each roll, then divide the lettuce, tomato, chicken and avocado equally between each bun, finishing with the top of the roll. Serve with a side of coleslaw and pickles (if using). Want an extra special treat? Serve your burgers with a handful of sweet potato crisps – YUM!